Thoughts: What better place to retreat to to lick your wounds and ponder your next step than a book. In this series, you can do that quite literally. The third book in Jasper Fforde's Thursday Next series sees Thursday joining the BookWorld police force, Jurisfiction and moving into a unlikely to ever be published book for a little down time. Like it's predecessors, The Eyre Affair and Lost in a Good Book, The Well of Lost Plots is funny, easy to read and full of wonderful ideas and thoughts. You can find yourself twisted around a bit and trying to work out which way is up at times, but Fforde usually unravels it for you at some stage. In fact, I think there are hidden depths to Fforde's books. There is a lot in there for a book group to discuss. 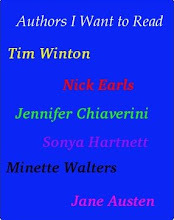 In this the idea of there being no original ideas left is one that has been discussed in literary circles before. Are there any original ideas? Do we need them? How are they generated? What happens to all the ideas that never actually become books? I'm enjoying this series and will keep reading it but I feel there is great benefit is spacing them out. In this case, I think too much of a Fforde thing could be a challenging thing! 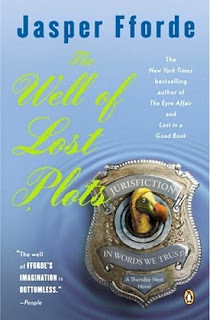 The Well of Lost Plots gets 3 stars!